I’ve spent the last six years looking for a cure for the nameless sickness eating me up. If I believed there was one out there, I would keep searching. But there isn’t, so I’ve come back home, where my past and present tangle. Come home to live... and to die. Eli Lang is a new-to-me author. I wasn't sure what to expect after reading the blurb and deciding to read the story. After reading it from start to finish, I'm still unsure of what I read. I had a difficult time falling into the story, never truly connecting, and this has me feeling conflicted as I write my review. With a slower pacing, without much of a set-up, I felt confused, as if dumped into the middle of a second book. The author does release some of the information in bits and pieces throughout the novel, but never enough to clear up the confusion. Not that Half has a complicated storyline, but the world-building is so piecemeal, I had a hard time connecting. Well-written, a beautiful story, with an intriguing concept, Half never gripped me. It was an issue of ‘not my cup of tea’ mixed with execution issues – the way the information was delivered. Luca is half-fae, half-human. He's living with a terminal illness as his human side and fae side conflict within his DNA. Health failing, after scanning the world for help, Luca has given up all hope. However, his father hasn't, turning to Kin to find aid. Luca, while having no hope of a real cure, connects with Kin, who is trying to cure him. The romance blooms quickly, instantly, between the two, with an edge of sadness. Luca has a conflict of conscience – take a cure, not knowing if it will work, with the risk of being immortal if it does. A large majority of the novel is spent with Luca contemplating this decision. All in all, no matter how beautifully written, there wasn't much going on in the novel, with the exception with the confusing fae world-building. The story revolved around Luca's illness, his relationship with Kin, whether or not to take the cure, and family ties. There was a great deal of description and flowery prose. While this gives off a beautiful, ethereal feel, I felt it bogged down the pacing, drawing out an already slow book. My reading style leans more toward a faster pace. I do believe this book has an audience, which will highly appreciate it. However, I don't believe I am said audience. 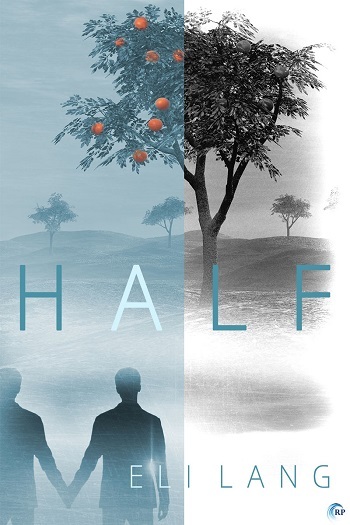 Reviewers on the Wicked Reads Review Team were provided a free copy of Half by Eli Lang to read and review.